So here I am on the eve of a New Year and, significantly for me, the year when I will achieve/celebrate the birthday that dare not speak its name . . . . . . aargh! 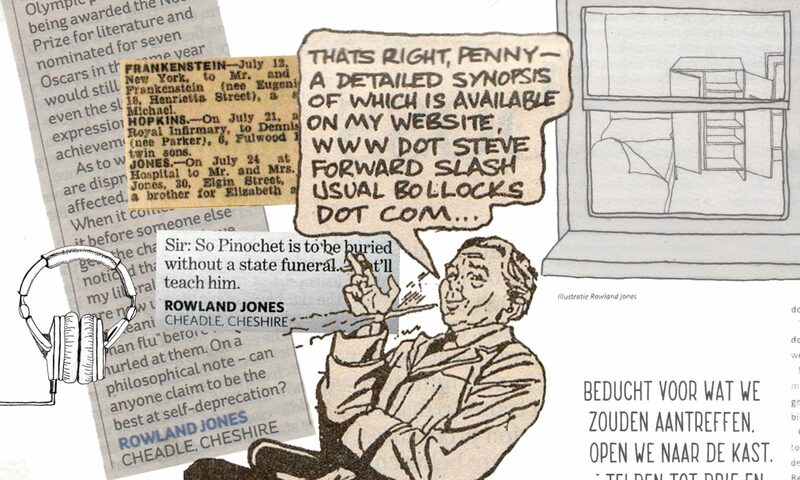 A year during which jokes about my age will NOT be appreciated ….. just remember: everybody who feels smugly younger will eventually be that old…. if they’re lucky….. and once you’re over about twenty-three there’s ALWAYS somebody who thinks you’re old…..
Planning to start writing 1000 words a week? Why not consider the more achievable goal of one decent sentence a week? Or turn to the classic (and short) haiku. Planning a more active outdoor life: begin by buying some hiking boots, opening a window, and breathing deeply: then reward yourself with a beer. Planning to lose weight? buy a more accurate weighing scale so you can see whatever minuscule increments you achieve. Also try plotting your ‘weight loss’ graph in grammes rather than pounds. decide on achievable goal . . .. and then halve it..
Xmas is good fun, but sometimes when all the excitement has died down particularly between Xmas & New Year, I sometimes feel at a bit of a loss. But yesterday was different not only was the sun shining but a parcel arrived from Bob Koch at Quiver. Both my wife and I are fond of leather… make what you will of that comment, but I’m actually talking about leather luggage. Once in a designer shop in Manchester, my wife was surprised by the Spanish owner, whilst she was admiring . . nay, stroking… a leather hand bag… he exclaimed; ‘Eet is like a pet, no? !’ So I’m very fond of leather goods, but occasionally the actual weight of the leather makes a bag heavy before you’ve put anything into it! 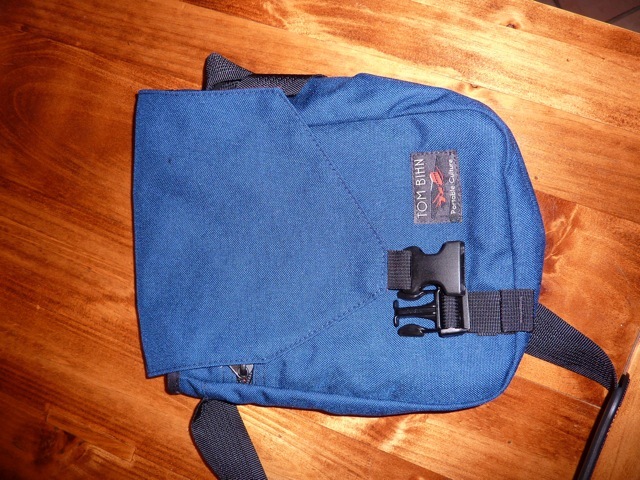 I have a beautifully made Mulberry shoulder bag which will probably last into the 23rd century: however it is so heavy that I always need to check whether I’ve actually loaded it up with the requisite drawing & writing equipment before leaving base. I mention this, as I was surprised at how light the Quiver package was. 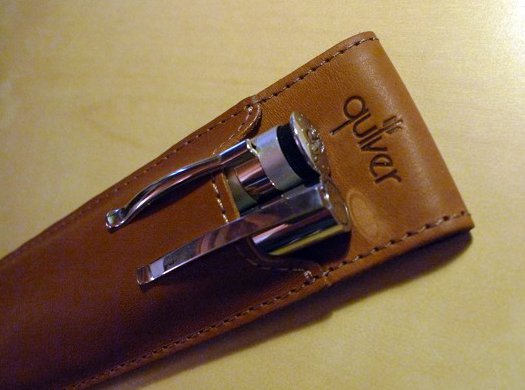 However I was more than pleased when I saw the ‘Quiver’ products. They are well-made from a soft but I would reckon very durable leather. 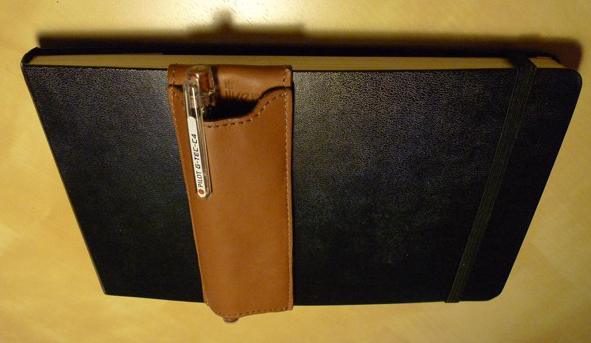 Essentially the Quiver is a slim leather pouch designed, in this model, to hold two pens/pencils. 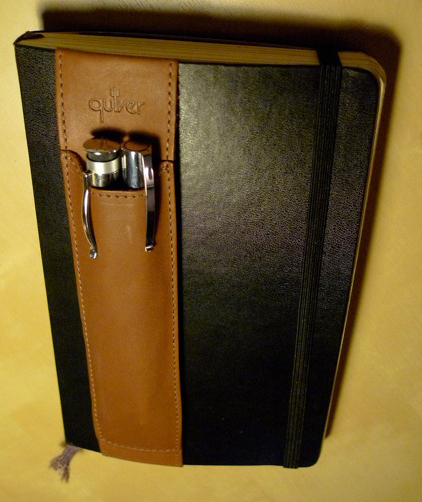 The Quiver is attached to the cover of your notebook, using an elasticated strap. Shown here are the ‘Double pen’ Quivers, designed to fit on either the large Moleskine, as seen here with Faber-Castell Perfect pencil and Ambition fountain pen, making a stylish and practical team if ever there was one. 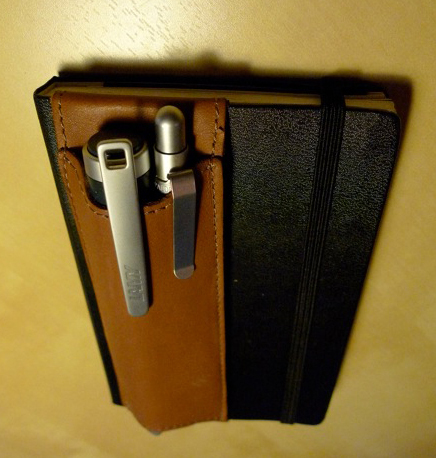 The version for the pocket size Moleskine is open at both top and bottom to enable you to carry longer implements! Here even with a chunky Lamy Nexx fountain pen, there is still room for a lovely little A.G Spalding pencil. There is also a single pen version . . though personally I find it hard enough to limit myself to two implements at a time! Again this comes in two versions to suit large or pocket-size Moleskines, and all four models are available in black as well as classic brown. The design is simplicity itself, and classic. Buy one and enjoy it. Just a small point: some of you, like myself, who vary our notebook size and format might be concerned that the Quiver design is created to fit the portrait format Moleskine notebooks… so what about the landscape format watercolour notebooks? GOOD NEWS!!! The pocket size twin will fit on the large sized Watercolour version. I normally only post stuff from my journals, but as I am writing this, Archie and Felix, the feline directors of Jones Towers are demolishing the Xmas tree, and running up and down the spiral staircase as if if they had been living on a diet of amphetamines for several days. Inevitably Simon’s Cat sprang to mind. Xmas day! Lesley bought me a bin bag for Xmas!! It’s just what I wanted a bin bag – ir to be more precise a Tom Bihn bag: big enough for a paperback, small Moleskine, a selection of writing armaments, a phone and a slim wallet-i.e. virtually empty wallet! Well made, good design, light, and not a strip of Velcro insihgt..God how I hate that sound. 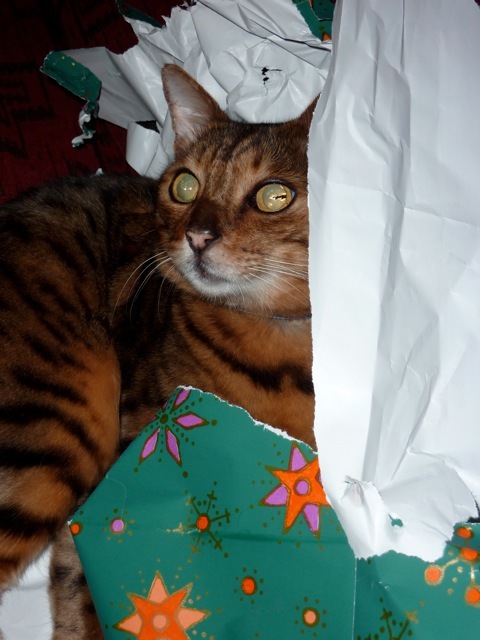 Meanwhile whilst I was stroking my new luggage Arhcie was enjoying the wrapping . 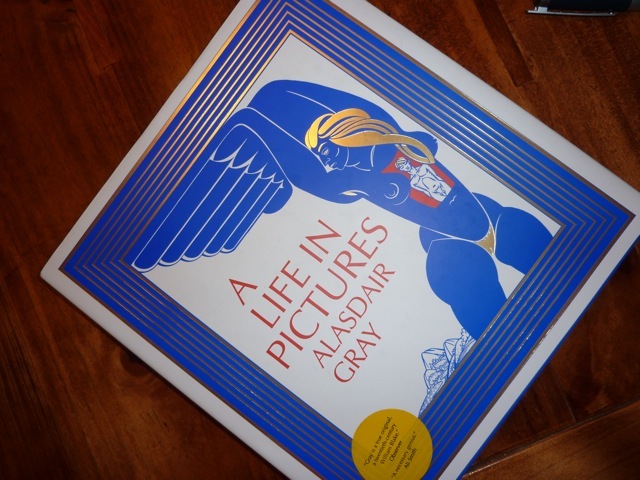 . .
Lesley also found this wonderful looking book on Alasdair Gray and Lesley’s son Ben bought me Keys to Drawing with Imagination by Bert Dodson, which I’m planning to work my way through in the New Year… it looks fantastic. So hoping everyone else out there has been as lucky as me! Well this will probably be my last post before Xmas Day! So Merry Xmas, Buon Natale and Nadolig Llawen! 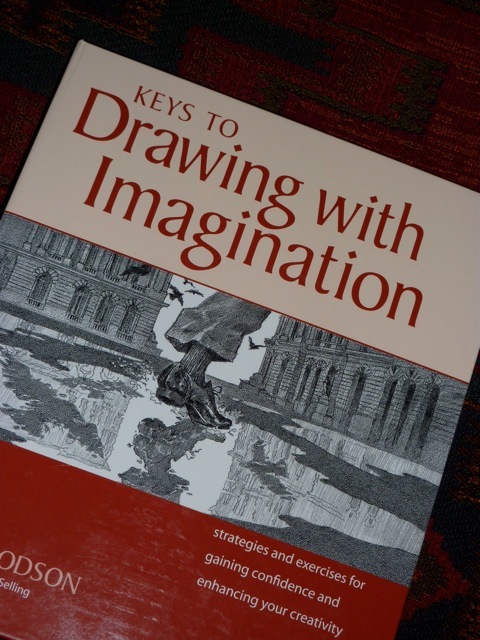 Found this interesting piece by Marshall Vandruff where he outlines some ideas about creativity. I especially like the third point, about finding your own ‘voice’. A little boy is a monkey. Apartments are filing cabinets for people. The smoothness of a woman’s skin placed next to the scaliness of an alligator. The chaos of a crowd placed next to the order of columns on a Greek building. The bright colors of a rainbow hoovering over a dark and shadowed valley. example, if you want to create detailed paintings that are as real as your own flesh, but you cannot sit still for a minute, it will seem like torture for you to create this kind of slow and carefully rendered art. If you find a way to create to fit your jumpy, quick nature, you will love, do it all the time, and eventually become great at it. Typnig errors . . .
For those of you who quite understandably don’t recognise the hunter with binoculars, that phrase should read: ‘hunt and peck’ usually ‘ . . . and miss’ . . . . well, it was early in the day . . . .